It's 300-odd MiB. 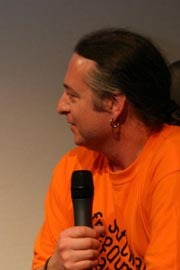 For those skipping through it, I'm the longhair in the orange T-shirt in the latter half, as seen here on the right. This part was printed at 10:10pm Austrian time on the 13th September 2006, and was fitted the following morning (I got carried away celebrating the moment, OK?). For the record, it involved 15390.4 mm of travel, 11240.9 mm of extruding, has a volume of 4.777 cm^3 and took 6690.9s to print (about 1 hr 50 mins). Oh yeah, it works. Things are going astoundingly well here, except for networking issues which prevent me from uploading pictures. 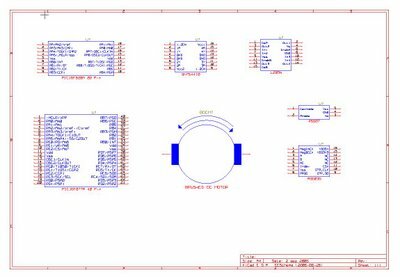 But it is probably worth mentioning that last night I completed the first full part for the RepRap and I'll be fitting it this morning. It's the largest thing printes so far containing - if I recall correctly - 4.4cc of polymer and taking 1hr 10 mins to print out. The improved print speed is due to the lack of excessive head cooling during the workpiece cooling cycles. If you look at the Youtube clip (see comments to previous entry) you'll see that I've chopped up a clear plastic bottle to create a windshield. 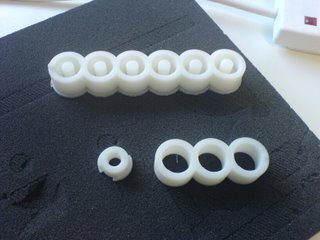 Rolling 3mm polymorph by hand has been part of my life all week, and it's good to hear the news from the builder's blog that it might be possible to get pre-made fillament. For those in Vienna, check the Metalab.at site for details on tonight's "How to build your RepRap" session and come along to this morning's brunch if you can. Tomorrow, we shoot the Taugshow interview, which given Johannes Grenzfurthner's reputation (see his Wikipedia entry) should be very interesting - for me at least! Greetings from Vienna, or as they say in these parts "Servus!" Zaphod has survived the trip, and despite having flown Auckland-Sydney-Bangkok-Dubai-Vienna sustained remarkably little dammage (a few disconnected wires, a detatched circuitboard and a broken fan housing). The Vik however was totally knackered, and took about 3 hours to reassemble the pieces. Aha! Found the apostrophe on this QWERTZ keyboard (or kezboard as I keep doing). We've had a wonderful reception by the Paraflows '06 organisers, and the Metalab - particularly Philipp who is kindly putting me up for the duration. I am sorry I was not awake enough to go out on the evening festivities with Angela and her loyal crew. Hopefully we will have other opportunities. But now, time for breakfast in Vienna. 1. 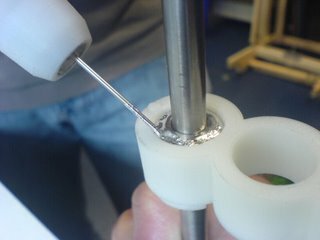 Casting the metal in a mould with the 8mm steel bar in situ, using silicone grease as a spacer. 2. 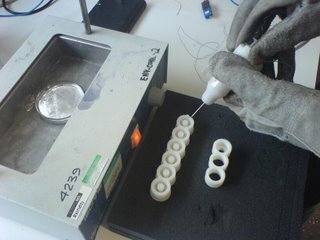 Casting the metal in a mould with a plug that could be hammered through once the metal had solidified. Method 1 - 3 hole mould and cap used to locate the rod and seal the base. 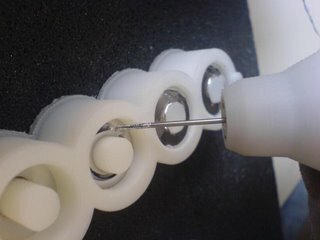 Method 2 - 6 hole mould with varying plug diameters, the support material needs to be left on to hold the plug in place. I got the Solarbotics gearmotors in today. I laid the little yellow gearmotor that Adrian sent me months ago alongside the GM3 that I bought and I can say this. If these weren't made for the same manufacturer they were made by the same factory, somewhere in Guandong province in the Peoples' Republic, I suspect. The mounting holes on the case are identical as is everything else right down to the distortions to the outside of the case that come as a result of reinforcing struts inside cooling in the injection molding dies. The gear ratios are different, I suspect, because of a change in the nature of the windings. 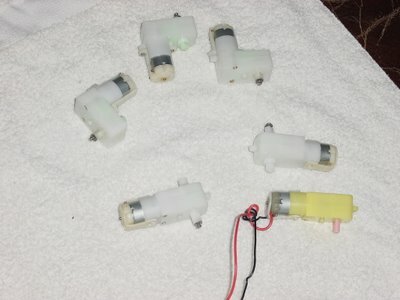 The motor cases are identical. There is no need to change the Mk II STL file for the mounting block for the gearmotor. I bought the GM3 with its 38 rpm peak rotational rate largely because I didn't need all that much rotational speed on the Mk II polymer pump motor and I wanted to put a shaft encoder on it. Dan at Solarbotics said that he would be more than happy to plunk the GM9 gears into the GM3 gearbox if we needed that higher rotational speed. 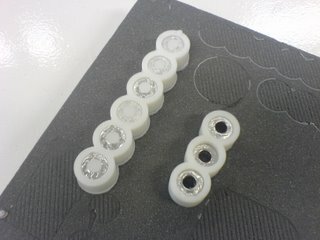 The mounting holes on the GM8's with its different gear box and motor orientation are in a different place. This shouldn't be a problem, though. Ah ha! There is a difference. While to drive shaft is a double flat on the Solarbotics just like the one Adrian has it is enough bigger that it is too robust to fit in the motor coupling that he made for the Mk II. 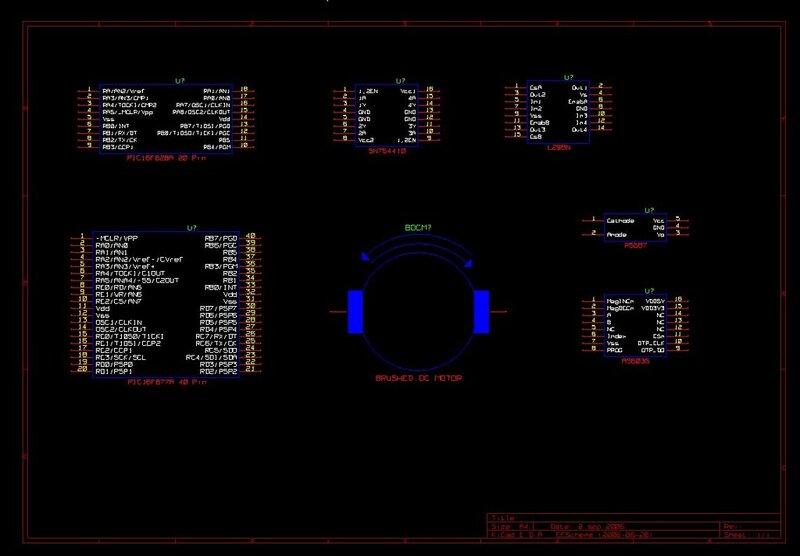 I went ahead and created components for the usual sorts of things that we use around here. 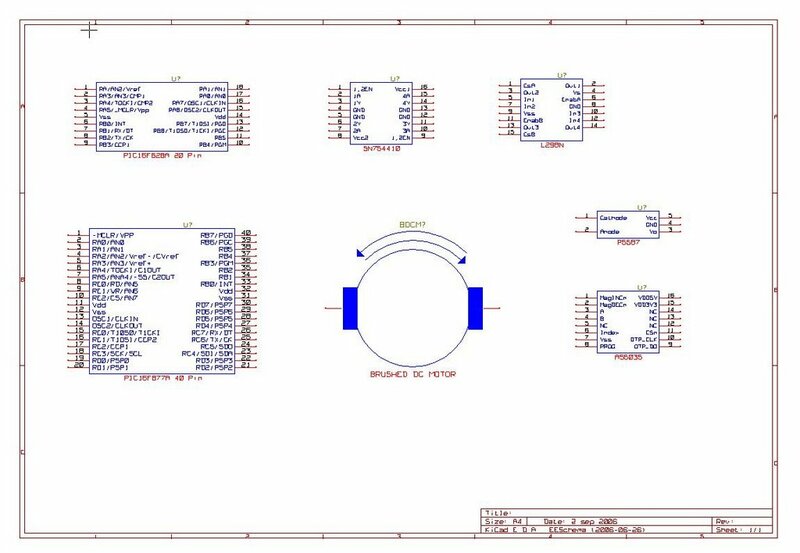 Most of the components we ordinarily use are already in KiCad's libraries. These include the 16F628A and the 16F877A. 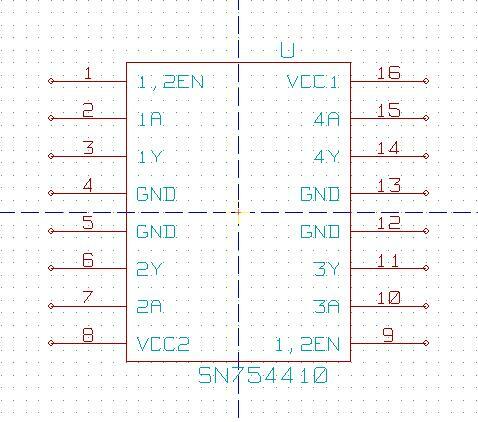 I just hate the serendipitous manner in which they distribute pins on their IC's though, so I went ahead and did them like they are on the data sheets. 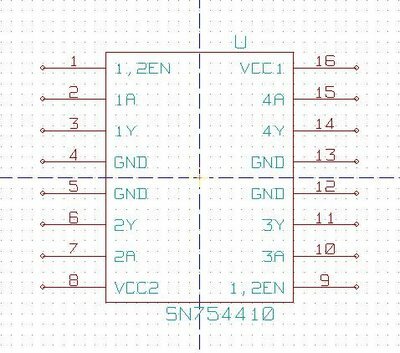 We're going to have newbies trying to build these boards and it's confusing enough trying to see what connects to what without some boffin playing 52 card pickup with the pin numbers on the poor okies. BTW, I've already seen the typo with the 16F628A. I called it a 20 pin chip when it is actually an 18. I fixed it but don't want to generate a new sample sheet this evening.